If you are used to working with EPS (encapsulated PostScript) files, you will know that it is possible to reduce or enlarge an image without loss of quality. This is because the information used to generate the lines and shapes in your image is stored in a series of mini databases, called "vectors," which describe a line exactly the same regardless of the final image size. The only thing that affects the quality of a vector-based image is the resolution of the device being used to display or print it. Vector-based images are generally described as "draw" graphics. The Illustrator files on this disc are draw graphics, and can be output at any size without loss of line quality. Photographic images, however--such as the grayscale relief images on your Mountain High Maps discs--are made up out of thousands of individual square dots, called "pixels," which, when viewed collectively, merge together to give the illusion of a continuous tone image in much the same way that a halftone screen does. Consequently, the quality of the final image depends as much on the number of pixels in the image as it does on the frequency of halftone ruling--when you enlarge an image, the pixels get bigger and more noticeable. Pixel-based images are generally described as "paint" or "bitmapped" graphics. Save your globe in EPS format, using Photoshop's "Save As..." command (select "binary" in the dialog box). Place your globe in a circular picture box (make sure the box doesn't have a frame thickness). The rough rule-of-thumb guide for determining the final resolution of a pixel-based image is to give it around twice the number of pixels per inch as you will give it halftone lines per inch. Thus an image to be printed with a halftone screen of 150 lines per inch (lpi) should have a pixel resolution of 300 pixels per inch (ppi)--which is the highest resolution of Mountain High Maps images. In practice it is generally okay to give a map image a slightly coarser pixel resolution--even as low as 150ppi--without noticeable deterioration in quality. If you intend displaying your maps only on a monitor, 72ppi is sufficient (provided you don't enlarge them), since that is the resolution of most monitors. If you intend outputting a map image at a smaller size, you will be able to do so with most applications which allow picture re-sizing. The quality of the output image will be unaffected (gray levels notwithstanding--see page 22), since by reducing the image size, you are effectively increasing its resolution--a 300 dpi image reduced by 50% will have an output resolution of 600 dpi. A reduction smaller than 50% becomes a bit cumbersome, especially if you are using many images, since the file size of the image remains the same, regardless of how much you reduce its dimensions. To change the resolution of the image--and thus reduce its file size--you must "resample" it (see below). Enlarging images can be more problematical. As explained above, when you enlarge a pixel-based image--in whatever application you use--you also enlarge the pixels until you reach a point when the pixels themselves become visible to the naked eye. Although making enlargements in your page layout or drawing application is less demanding on disk space and makes output faster, you may notice loss of output quality if you enlarge more than about 180%, although the degree of quality loss depends just as much on the halftone screen ruling you will use. To minimize loss of quality when enlarging an image, you must "resample up." To change the pixel resolution of an image as well as its linear dimensions, you must "resample" the image up (enlarge it) or down (reduce it). Resampling uses a process called "interpolation" to modify pixel information. You can see some resampling examples on page 23. You cannot resample a pixel-based image with a page layout or drawing application--you must use an image-editing application such as Photoshop. To resample an image in Photoshop, first check its current resolution. A quick way of doing this is to hold down the Option or Alt key while clicking on the image size box in the lower left of the window. Select "Image Size..." from the "Image" menu. 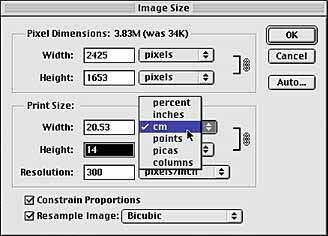 In the dialog box that appears, make sure that "Constrain: Proportions" remains checked if you want the proportions of your image to remain the same, and check "Resample Image"--"Bicubic" is best. In the "Print Size" portion of the dialog box enter either the height or width that you want the image to be (select your preferred unit of measurement from the pop-up menu alongside the box where you are entering your new size)--the value in the other box will adjust automatically provided the "Constrain: Proportions" box is checked. Click "Okay." Use the "Image Size" dialog box to change the dimensions of an image. To make sure that the image stays at 300 ppi after you have altered the size, check "Resample Image." After you have resampled your image, select "Sharpen > Unsharp Mask..." from the "Filter" menu. The dialog box opens with default settings. To see how much these affect your image, Click "OK." You may need to play around with the settings to get a desirable result, but an amount of 200% (you can go up to 500%), with a four pixel radius and a Threshold of four levels usually produces good results with a 300dpi image.